The Paramount Theater is a Charlottesville structural icon and it has been a complete honor to photograph events at this theater for over ten years. Last night was a pinnacle of sorts and completed the original vision when the restoration began in the 1990s. Many were in attendance – David Toscano gave a presentation as well as members of the Paramount’s board and staff, along with previous members of the board and original members of the restoration committee. The blade was installed a few weeks ago and was finally illuminated last night. The sign was a restored version of the original 33 foot blade, lighting up the mall for the first time since the 1960s. There was an outstanding cake shown above. 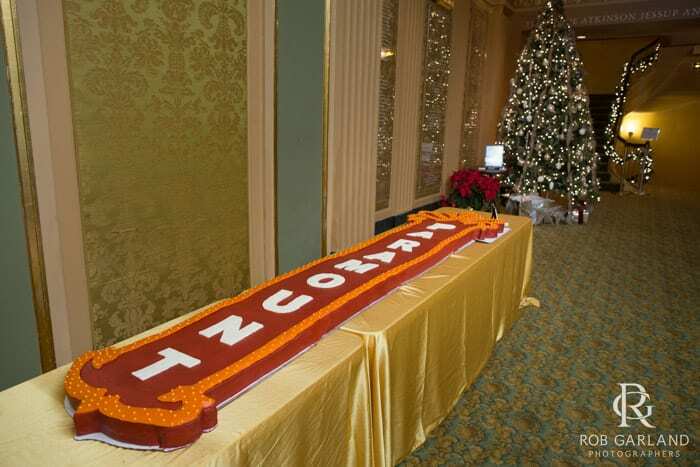 Honestly, that may have been the largest cake I have ever seen in person. 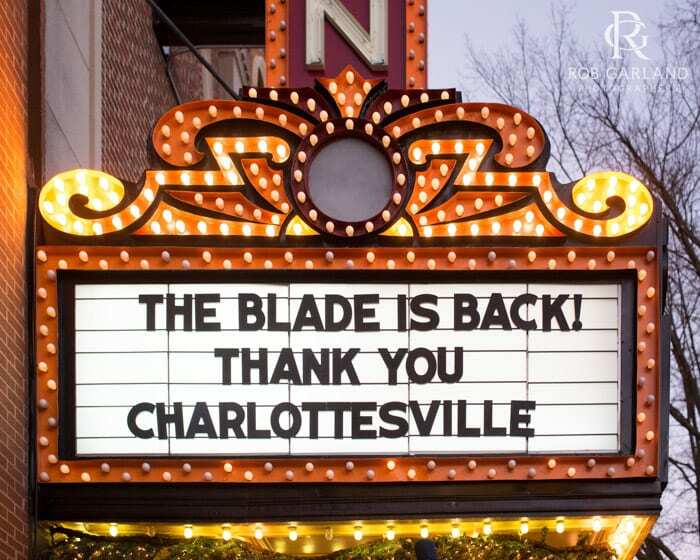 The Blade Sign, the final remaining element to fully complete the restoration of The Paramount Theater, which began in 1992, was dedicated to: “The Children of Charlottesville – Past, Present, and Future Generations.” Youth from the crowd joined Chris Holden on stage and assisted with the official lighting of the sign for the first time. Civic Access sponsored the sign language interpreting services for the presentation and lighting of the Blade Sign. The vertical blade sign was a brightly illuminated beacon that hung above the marquee from 1931, when the theater was constructed, until the 1960s. The Blade sign was part of the original comprehensive restoration plans that began in 1992, but was not completed due to budget restraints. The project to “Bring Back the Blade” was revived as part of the 10th Anniversary celebration of the reopening of The Paramount Theater. 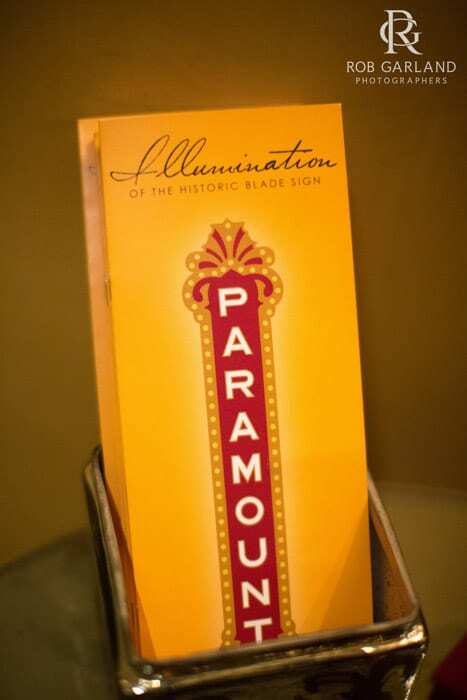 The Blade sign is the final element remaining to fully complete the restoration of The Paramount Theater. It is a befitting conclusion to the restoration as the Marquee was the first piece of the Theater to be restored many years ago. The sign construction began in September when the original architectural drawings were sent to Wagner Electric Sign Co., a company in Ohio specializing in theater marquee and blade sign restoration and reconstruction. Wagner built an exact replica of the original sign, with one small change: the use of LED light bulbs to replace the original bulbs. The current blade sign is 33′ tall, has nearly 600 light bulbs, and weighs approximately 3,000 pounds. The Paramount contracted with Nielsen Builders, Inc. who worked with Hightech Signs and Design Electric to install the Blade Sign once it arrived from Ohio. The installation of the sign took place on December 3, 2015. Following its Thanksgiving Eve 1931 opening, Charlottesville’s Paramount Theater became a landmark overnight. For four decades, the grand movie palace hosted hundreds of films, war bond drives, fashion shows, cartoons for kids, and popular rock ‘n’ roll artists, entertaining multiple generations of families. 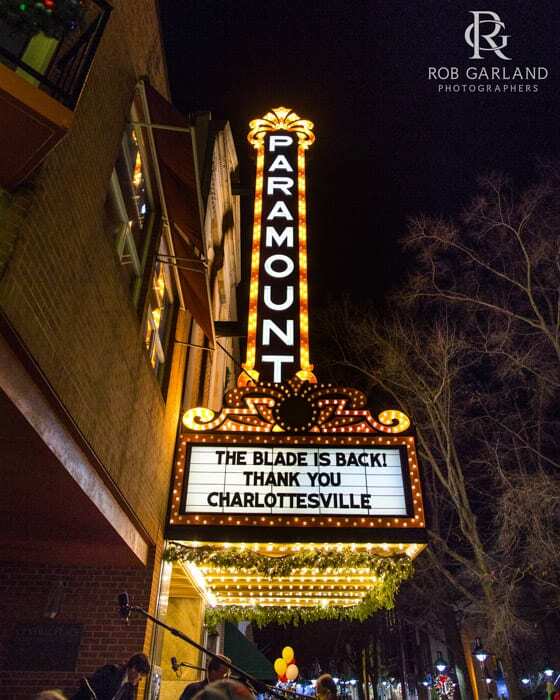 The Paramount remained Charlottesville’s crown jewel until businesses started to move out of the downtown area, finally closing its doors to the public in 1974. Even as the lights dimmed on the marquee, the theater was not forgotten. Almost from the moment it closed, efforts were launched to save the Theater from real and constant threats of demolition. 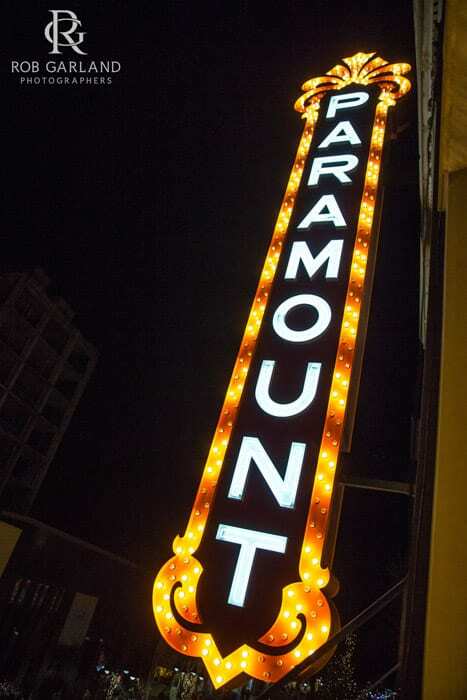 In 1992, the non-profit Paramount Theater, Inc. purchased the building and spent the next 12 years raising the funds necessary to complete not only the meticulous restoration of the Theater, but also the creation of new facilities enabling The Paramount to step into its new role as a regional performing arts center. The Paramount Theater opened its doors to the public once more on December 15, 2004 – more than thirty years after it had closed. The re-opening of the Theater marked a resurgence in downtown traffic and served as a springboard for bringing businesses back to the downtown area, with the Theater as its anchor. Now, ten years later, the downtown area is again the hub of our community and a vital part of our city. The theater is an iconic destination on the Downtown Mall, a showcase for the performing arts, and a gathering place for Charlottesville and the region. The transformation of the old movie palace to a twenty-first century performing arts center was a milestone for this community and region. 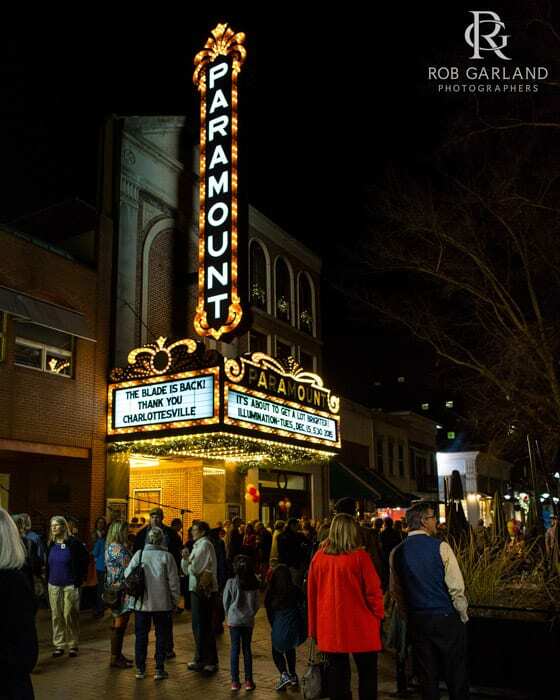 The Paramount won the City of Charlottesville Historic Preservation Award in 2005 after the theater was officially reopened. The Paramount Theater is a member of the League of Historic American Theaters, and is a significant part of our area’s history. The Theater culminated the 10th Anniversary celebration by lighting the newly-installed vertical blade sign for the first time since the 1960s. We thank the community for joining us to celebrate The Paramount’s history as well as its future. Following the Illumination, The Paramount invited everyone with a “Bring Back the Blade” button inside for a special holiday screening of Elf that began at 7:00PM. CarpetPlus and Z95.1 generously sponsored the screening of Elf. The evening concluded with a founders lounge gathering and the movie shown in the theater…..not to mention, my wife, Maran, live on the news. I would like to give everyone who supported this endeavor a huge shout out. The community thanks you.